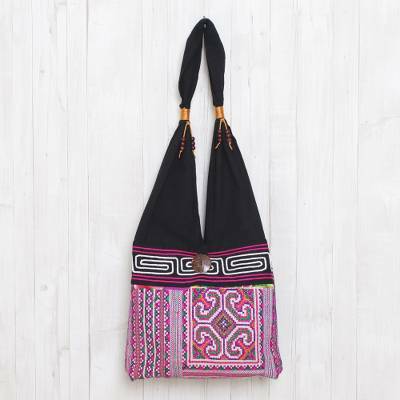 Pink and Black Boho-Chic Cotton Shoulder Bag from Thailand, "Thai Brilliance"
This beautifully bold boho-chic shoulder bag comes from Thai artisan Jiap Rojjana. Eye-catching Hill Tribe inspired motifs in an array of vivid colors are embroidered by hand on the front of the black cotton bag. Golden yellow cord and rain tree wood beads decorate the strap, with a coconut shell button for the closure. The shoulder bag opens to reveal a black cotton lining with an interior zipper pocket that is ideal for smaller items. You can find cotton shoulder bag 'Thai Brilliance' by Jiap Rojjana in handbags categories such as Bohemian Handbags, Geometric Handbags, Hill Tribe Handbags, Cotton Handbags and Shoulder Bags Handbags. Enjoy exploring these sections for other Novica treasures. Wonderful colors and embroidery. I love it. Thank you!